A "retaining wall" holds back (or "retains") the soil behind it. The pressure behind a tall wall, holding back tons of soil and water, can be enormous; considerable knowledge and experience is needed before undertaking such a project. Even a well-constructed wall would be compromised over time if the builder were to fail to provide a proper outlet for runoff, as water pressure would eventually build up to an unsustainable level. Always call the Call Before You Dig number before undertaking such a project so you won't be damaging buried utility lines. How Is a Retaining Wall Used? One of the most common functions of a retaining wall is to stop erosion on hillsides in cases where growing plants to control erosion is either undesirable or impractical. But you are underestimating the possibilities for these structures if you see them only as erosion-fighters. Consider how you are changing the "lay of the land" on your property when you erect a retaining wall. An area that is sloping and unusable can be leveled off (behind the wall) to create an outdoor living space, such as a patio, or to create new garden beds. For a different look, erect a series of smaller retaining walls, rather than one big structure, and terrace the hillside. Use the terraces to show off eye-opening flower beds. Do not overlook the aesthetic component of retaining walls. There are various ways that you can play up this component, including selecting a material that is in sync with your overall design goals. For example: Choose a beautiful, natural material for the construction that will enhance your landscape design in the way that any quality hardscape feature does. Stone is an excellent choice, although techniques for building a stone retaining wall differ from those for building a regular stone wall. By contrast, concrete blocks are not very natural-looking at all. But that's all right in a landscape design where the natural look is not the objective. For example, if you have a patio made out of concrete pavers, then a nearby retaining wall built with concrete blocks will complement it nicely. There are concrete blocks made specifically for building retaining walls, and using these makes the job go surprisingly easy. That's because they're interlocking, with a flange on the back side of each unit designed to slip neatly over the course below. They are also designed so that, as you lay course after course, the structure will continue to slope backward ever so slightly. 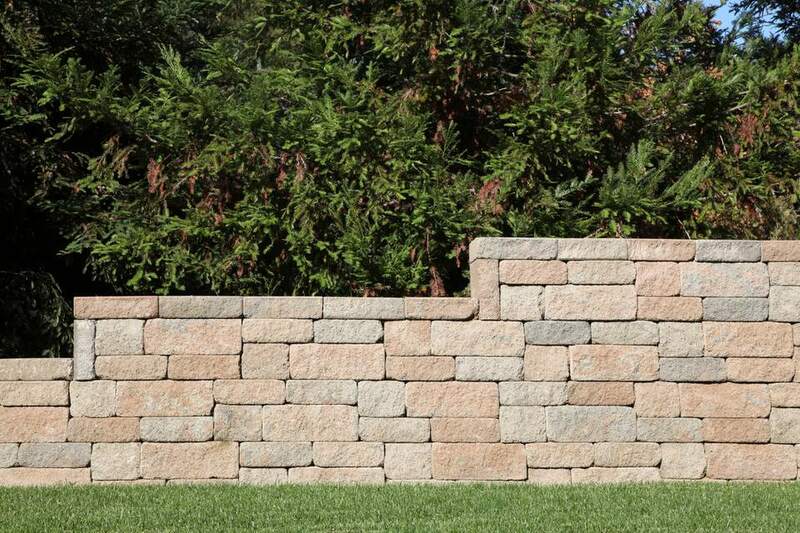 Combined with the heaviness of the blocks, these qualities result in a sturdy retaining wall. But many different kinds of materials can be used to build retaining walls. Which material you choose will depend on factors such as your design tastes, the function(s) of the wall, and cost. Poured concrete (reinforced with rebar) is commonly used in commercial settings. At the other end of the spectrum, pressure-treated timbers are popular in rural settings. Prior to installation, you will have to grapple with the basic question of whether you will be building the structure yourself or hiring someone else to do it. You can certainly build a 3-foot-tall wall yourself if you have even just average DIY skills and a reasonably strong back. But anything taller than that should be left to professionals. Not only will they have the engineering skills for the job, but they will also be up to speed with relevant building codes in your area. To build a 3-foot wall as a DIY project using concrete, first consider how bad water runoff is in the area; if it's bad, be prepared to install a perforated drain pipe behind your retaining wall before backfilling. Otherwise, follow these basic instructions (specifics will vary based on many factors, including local building codes, soil type, climate, and amount of runoff). Decide roughly where you want the retaining wall to be and dig back 2 feet from there into the slope; stretch landscape fabric over the slope to keep dirt from falling into the back-fill you'll be applying later. With this soil removed, mark exactly where the retaining wall will be, using stakes and string, with the string resting at what will eventually be the top of the wall. Under this line, dig a trench 2 inches deep and wide enough to accommodate your blocks. Ensure that this base is level using a screed and a carpenter's level; tamp it down. Apply about 2 inches of stone dust for your first course of blocks to rest on; tamp it down. With hammer and chisel, knock the flange off the blocks you'll be using for the first course (you don't need it here, and, without it, the blocks will rest more evenly on the ground). Lay a block on this base, at one end of your retaining wall. Check with your carpenter's level to ensure that it is level, both left-to-right and front-to-back. Repeat with the second block, laid down next to the first one. Not only must it lie perfectly even in its own right, but it must also align perfectly with the first block. Continue in this way to complete the first course. Lay the second course in the same way. But, here, you must stagger the joints, so that the "cracks" in the second course don't line up with those in the first course. Because this will necessitate having half-blocks at each end, you must have a tool on hand for cutting blocks. Continue to lay courses that are perfectly level, with staggered joints, until the necessary height is reached. Backfill with crushed stone as you go for added stability.